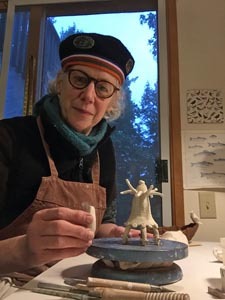 Nancy Walker doesn’t need much to create her whimsical worlds in clay. On one side of her working table it’s very civilized looking with an interesting variety of fine white porcelains. But on the other end it’s all as black and messy as mud pie from this clay called Midnight. This stark contrast between light and dark infuses her work with a lively balance. 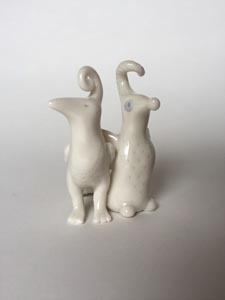 Connection, communication and a thoughtful humour is a thread that runs through all of her work, large and small. Her portaging Life Boats, carrying all sorts of figures, refuses to acknowledge a rank of species size, no conversation or question is too small. Her Gathering Bowls are edged with birds, crows, elephants, octopuses or mice and are full of conversations among everyone.